The scene of Jesus cleansing the temple has always been more than a little bit scary for me. I think the reason is that my “turn the other cheek” version of Jesus doesn’t allow for this kind of radical behavior. This is over-the-top and scary Jesus sort of stuff. 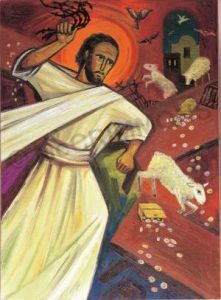 Angry Jesus, the one who turns over tables and scatters sheep or who curses fig trees, is an unpredictable and fearsome Lord, one who will not be tampered with, placated, or pandered to. Just in case you think this week’s gospel reading has nothing to do with us in 21st century western Christendom, consider what moneychangers exist in our modern congregational edifices. Consider what currency must be exchanged in order to “rightly” worship and enter the community today. We may not have doves, sheep, and cattle in the sanctuary, but what about the worship battles between organ and piano lovers, or competing capital improvement project plans that so many faith communities struggle with? We are still at risk of falling into the trap of a currency exchange of faith. What are we to do? I believe that it’s about falling wholly in love, being swept off our feet by the risen Christ and fully focused on following him. Branding, innovating, reframing, and reimagining church is not necessarily a bad thing; in fact, it is necessary to measure how we’re doing in communicating the good news and equipping God’s people, but being church is not so much about marketing and metrics as it is about faithful discipleship. You can bet your last goat or turtledove that when we do get sidetracked, the all-consuming Jesus will start turning over a few tables and discomforting the comfortable. Be ready. Be prepared. Put on those crash helmets and expect a miracle.